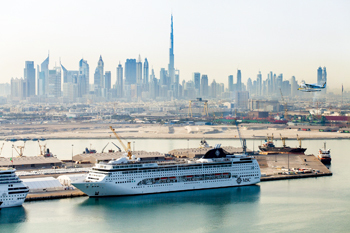 Dubai Cruise Tourism has announced that Dubai’s cruise season saw its busiest month so far in January 2015. The cruise terminals in Mina Rashid welcomed over 30 ship calls, bringing over 150,000 cruise tourists to the emirate in just one month, including 26 hub ship calls from four cruise lines. Mina Rashid also accommodated five cruise ships at the same time on two occasions in January – a first in the terminal’s history – as well as welcoming Cunard’s Queen Mary 2, the largest cruise ship to call in the GCC. January 2015 saw major cruise lines visit Dubai, including Costa, Aida, TUI, MSC, Cunard, Phoenix Reisen, Fred Olsen and Holland America. The busiest week was 25-31 January with a total of ten ships in port. For the first time in its history, Mina Rashid twice catered to five cruise ships at the same time – on 10 and 31 January – representing approximately 50,000 cruise tourists. The Cruise Tourism Department arranged for a grand ceremony to welcome these international tourists with live band performances as well as entertainment events for all ages. The Hamdan bin Mohammed Cruise Terminal, inaugurated on December 11 this year, is the world’s largest and most modern covered cruise facility, enabling award-winning Mina Rashid to handle complete passenger turnaround of five cruise vessels simultaneously, accounting for more than 25,000 passengers.